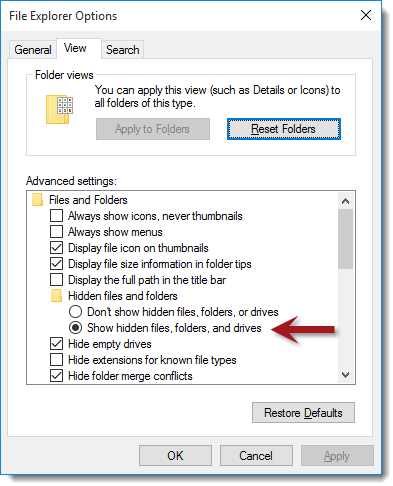 How to show hidden files and folders in Windows. When setting log permissions, you may need to configure Windows to show all hidden files and folders so that you can set the permissions properly. Whether it is for log permissions or some other reason support as sent you to this page, here's how to do it. With Windows XP: Open My Computer from the desktop and click the Tools menu. From there, click Folder Options. With Windows 7, 8 and 10: Press the Windows key on your keyboard then type folder options. You should see Folder Options (7, 8) or File Explorer Options (10) appear. Click on Folder Options. Once the Folder Options window appears, click the View tab. The above screenshot is for Windows 10 but the options in Windows XP through Windows 10 are all the same. Find the Hidden files and folders section and click the Show hidden files, folders and drives (or similar) option. Once you have selected the right option, click the Apply button to apply the settings. Now your computer will show all non-system files in Windows Explorer for easy navigating.